Honoring graduates who have had a positive impact on their profession, the community and our university. 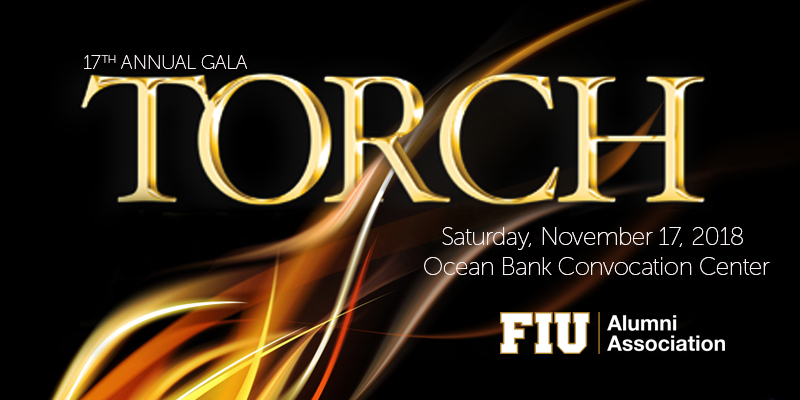 This year, the FIU Alumni Association will host its 17th annual Torch Awards Gala at the Ocean Bank Convocation Center. The Torch Award is the highest honor bestowed upon alumni and faculty by the FIU Alumni Association. It recognizes FIU supporters who are making positive impacts on their profession, the community and our university. Join us for an unforgettable evening as we celebrate these extraordinary alumni and faculty. Indulge in a three-course meal and dance the night away. Beyond paying tribute to FIU’s impressive supporters, the event will support the future construction of our FIU Alumni Center. Serving as a multi-purpose facility for academic, social and business gatherings, the space will recognize donors, share university history and showcase both student and alumni accomplishments. The FIU Alumni Center will foster and encourage lifelong connections between Panthers. Proceeds will also benefit the First Generation Scholarship Program, which provides financial support to qualified undergraduate students who are the first generation in their families to attain a college degree. All donations are matched 2-for-1 by the state of Florida, tripling donor impact and making dreams come true for many deserving students.